In 2006, Marin County enacted a goal of 80% landfill diversion by 2012 and Zero Waste by 2025. Delicious! Catering, along with most Marin County residents, have embraced this challenge. Everywhere you look, there are waste collection bins in a rainbow of colors. We know that clean paper goes into the blue can, bottles and cans go into the brown can, and food scraps go into the green can. Even with the multiple bins and options, there are still challenges ahead to reach the Zero Waste goal. How many of us use plastic wrap? As a catering company, we sure do! It is one of our greatest environmental foes. It continues to be a source of frustration as we try our best to be a proactive company. At this point, the landfill is the only place for plastic wrap to go. What do we do? What other options are available to cover and seal all of our food items? Is there a way to recycle plastic wrap? Yet we still have to make sure we follow all food safety guidelines. Finding an alternative approach or product will take thought, research and discussion. Other considerations include what to do with common products that you don’t want to put in landfill, but don’t know where else to put them. What do you do with packing peanuts or dried up nail polish? 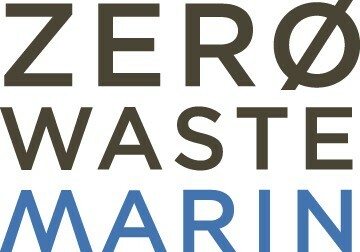 Check out Zero Waste Marin’s Recycling, Disposal & Reuse Guide. This is an excellent guide for where to take frequently disposed of items, so that they do not end up in the landfill. It is time for all of us to stop before we drop something in to the black landfill can and ask, “is there someplace else this could go” or “next time can I choose to do something differently that will not produce this waste”? We are working with our team of office, kitchen and event staff to ask these questions so that we can begin to make more thoughtful choices about our waste. The Zero Waste 2025 goal will be here before we know it. Are you ready?